RIGHT-> RIGHT -> DOWN -> DOWN. 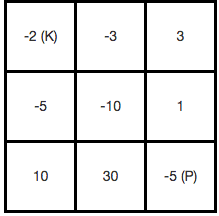 Your function will get an M*N matrix (2-D array) as input which represents the 2D grid as described in the question. Your function should return an integer corresponding to the knight’s minimum initial health required.